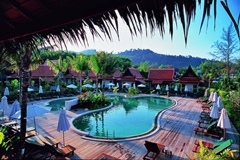 Find rooms, resorts and bungalows in Khao Lak, Thailand. We are happy, that we can offer you now bungalows and family bungalows at White Sand Beach. family bungalows for 5 to 6 persons for 3800 and 5000 Baht. If you are planning a holiday or vacation in Khao Lak we can help with your booking needs. Resorts, rooms, bungalows, family vacation homes, and vacation rentals are available in this site. Many of the listings are "book direct" however we do provide booking service for many of the resorts listed and can pass on savings to you thanks to our special rates. A golden-beige ribbon of sand, picturesquely interspersed by some rocky outcrops, divides the blue waters of the Andaman Sea from lush green palm groves. A belt of casuarina pines and coconut palm trees hugs the 12 km long beach of Nang Thong, Bang Niang and Khuk Khak as far as Laem Pakarang, the Coral Cape. In the flat land, 600 to 2000 meters inland, rubber and coconut palm plantations, fields and tiny villages extend into the distance. Many lakes hide in between, remnants of the flourishing tin mining industry that started nearly two centuries ago. Setting the stage to this vibrant tourist area with many beach resorts, bungalow villages, hotels, and guesthouses is the magnificent backdrop of the densely forested Khao Lak-Lamru National Park right behind Khao Lak Center, also called Nang Thong and Ban Bang La On. Two km further north along the H4 is the small town of Ban Bang Niang. Here, small hotels, guest houses, restaurants, shopping areas and a very popular open market can be found. The beach is just 1 km away with its first class resorts and popular bungalow villages. The name Khao Lak is derived literally from one of the main mountain peaks ( Lak mountain ) located in this small mountainous region about one (1) hour north of Phuket. The area is generally a series of villages located mainly in the Takua Pa District and partly in the Thai Mueang District in the province of Phang Nga, Thailand. The original beach Khao Lak was located between Sunset Beach and Nang Thong Bay at the foot of the forested mountains of Khao Lak National Park where nowadays the Moracea Resort is located. As Khao Lak and neighboring villages rapidly began to expand through the introduction of seaside resorts and tourist related businesses the generalisation of the name Khao Lak has spread almost as far north as Takua Pa. The sandy beaches of Khao Lak now extend for over 30 km from Thap Lamu estuary until the river mouth of Takua Pa River in the north. 32 beautiful bungalows and double storey houses with aircon, nicely decorated, in an extensive tropical garden, directly at the beautiful sandy beach of Khao Lak. Very attentive owner and staff. 3 bungalows with aircon close to the beach, all bungalows and houses generously spaced, all rooms with ensuite and terrace or balcony, restaurant/bar at the beach, swimming pool, deck chairs, beach shower. Two new two-storey hotel buildings for guests who prefer this type of accommodation. The rates are among the lowest of all beach bungalows in Khao Lak: Only 2350 to 3850 Baht. Set in a natural environment, even having a brook running through it, this is an extremely attractive setting. 25 single bungalows with aircon. 24 spacious, comfortable rooms and family rooms in apartment buildings. 30 rooms in the Seaview House (with the 2nd and 3rd floor having the best sea view). English-speaking management, beachfront restaurant and a beautiful swimming pool. They have their own beach area with deck chairs spread out near the beach. Many guests return every year. Booking in advance is mandatory. Independent alarm system with 24-hour security. Only 2000 to 3000 Baht per night for 2 persons, including tax and service charge. Breakfast is served separately in the restaurant. This is a unique, scenic bungalow complex in traditional Thai style. 29 aircon bungalows each having a total area of 43 square meters, of which 28 square meters is the sitting room and bedroom. In each case, three bungalows stand in an open courtyard, with water features and streams in the garden. The beautiful beach is just 100 metres across the road. With our Super Special Rates you get an exceptional value for money!! The Thai Style Chalet costs 1400 Baht per night for 2 persons incl. breakfast, tax and service charge. The Thai Style Bungalow costs 1700 Baht per night. Only valid from Internet Booking Service Khao Lak! Only 1400 to 1700 Baht per night in the green season. Including Tax and Service Charge. All rooms are spacious and have air-conditioning, the large living room with kitchen is very well equipped with all modern facilities. The bathrooms have warm water, one bathroom has a bathtub, too. Green Garden Villa is situated 20 km north of Khao Lak in a rural landscape, just 5 minutes by bicycle to the lonely sandy beach with hardly ever a tourist in sight. The rate is only 4700 Baht per night up to 6 persons including tax, water, electricity, laundry, cleaning service once per week. You need a taxi transfer to Khao Lak? Our Taxis will take you from and to the airport safely, and our drivers have a green taxi license plate and a real taxi drivers license! All our drivers drive very carefully and defensively. The speed limit for taxis in Phang Nga Province is 90 km/h! On this road from Phuket Airport we drive you any time of the day for 1600 Baht, which is very good value for money (for 3 persons only 2000 Baht, night surcharge 500 Baht). The official price for two people with airport taxis is 1800 Baht (due to expensive fuel prices). Some taxis will offer this transfer for rockbottom 1300 Baht, but they are outlaw taxis and have no taxi license plate, must drive 4 times daily, and their nerves are on edge, which can be dangerous! Prices of 700 Baht as sometimes advertised on the Internet, are fairy tales. Some mini buses offer airport transfer for 1200 Baht, but these are not private taxis for which their charge is actually too high. You may arrive hours too early for your leaving flight or have to wait for other passengers from an arriving flight. Dear Friends: The new website www.t-globe.com is online! After 5 years of intensive work the new generation web portal www.t-globe.com is online! Please have a look and try out various subpages with lots of new information. Not all pages are complete, but we are heavily working on them. Can you imagine: For the South of Thailand we have over 2600 English pages online, they feature 7500 accommodations, 2500 restaurants, 2500 service businesses, 800 touristic shops and entertainment venues, and 1400 attractions. We have uploaded over 120,000 photographs and produce several hundred more every day. Many of these pages are also available in Thai and German language. Registered users can print out all this information as their personalized Thailand Travel Guide Book. We (Richard and Dagmar) can help you book your holiday bungalow in Khao Lak.